Sloops were oceangoing antisubmarine vessels in Commonwealth service. They were a response to the 1930 London Naval Treaty, which limited destroyer construction. Ships of less than 2000 tons standard displacement; with guns of not more than 6.1" (150 mm) caliber, and with not more than four guns of greater than 3" (75mm) caliber; and which had a maximum speed not in excess of 20 knots were exempt from the destroyer restrictions. The British, concerned about the submarine threat to their commerce in the event of war, took considerable interest in ships of this type. 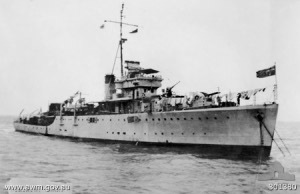 Sloops resembled destroyer escorts, but tended to be slightly smaller and significantly slower.